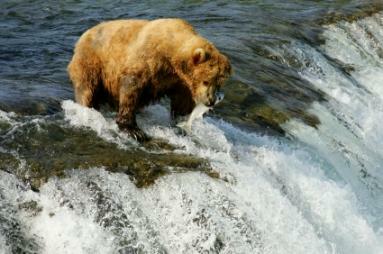 If you are a fan of high adventure trips, Alaska fishing and hunting vacations are sure to please. Alaska is truly the final frontier of the civilized world with more to explore than you could possibly fit into one vacation. If you love hunting and fishing, Alaska simply can't be beat. Planning your Alaska high adventure camping trip is just like planning any other backwoods camping trip, with one exception: the weather. The weather in Alaska can change in the blink of an eye so you need to be ready for anything. It can be 80 degrees one minute and snowing the next; so, always dress in layers and try to plan for the unexpected. In addition to your tent, be sure you have mosquito netting and insect repellant. Other items to add to your camp list should include a map and compass, camp stove and extra fuel, food and cookware, a cot and sleeping bag and of course, any fishing or hunting gear you plan to use. Don't forget about a permit! If you plan to hunt or fish, you will need a permit to do it legally. Prices vary for non-residents from $20 for a one day sport fishing license up to $500 for a bear tag in addition to the $85 hunting license fee. It may sound like a lot of money, but it's nothing compared to the fine if you are caught without a permit. More information can be found at the Alaska Department of Fish and Game. Sport fishing in Alaska offers amazing catches of salmon (King, Sockeye and Coho), halibut and trout. You can enjoy fly fishing or try a fishing charter. Be sure you know the rules of the area if you plan to go it alone. Many places require that you catch and release only. Guides will tell you the best places, bait and techniques to make your fishing adventure a success. Fisherman's Choice is one guide service that has been featured on ESPN2 and the Sportsman Channel. Their licensed guides will provide you with the trip of a lifetime whether you are a beginner or an experienced fisherman. Sports Den prides itself for award winning guides who can take you where the fish are. Recommended in Frommer's travel guide, this is an excellent opportunity for an exciting trip. A guided hunt will offer you the best opportunity for a trophy harvest. Some guide services will also assist you with licensing and permits. Often, much of your camping gear is included in the package. You are just responsible for personal gear. Most places will tell you what you need to bring on their high adventure trips. Alaska fishing and hunting trips frequently include a cabin, so if you have your heart set on a backwoods camping experience, be sure you have the details straight before you book. Alaska Wild Guides is one option for an unforgettable hunting adventure. They will help you obtain your licenses and permits. Then they'll help you find a trophy animal. Magnum Alaska Guide Service provides one of the best guided hunts you will find. Everything is included except airfare, hunting gear, and licenses. This is one you'll return to again. The list could go on and on. If you love high adventure, Alaska is the place for you. After one visit you're sure to come back again and again.